In the Design-Bid-Build method of construction, the project is completely designed prior to Rice Lake Construction Group bidding on the job. The architect/engineer is fully responsible for all communication, estimates, constructability and design. Traditionally, the lowest bidder is selected to complete the project in this project delivery method. Design-Build construction involves Rice Lake Construction Group working together with your architect/engineer from the beginning, starting with the design phase of the project. You’ll have a single point of contact throughout, Rice Lake Construction Group. In this method of construction, the Design-Build team is fully responsible for the project. 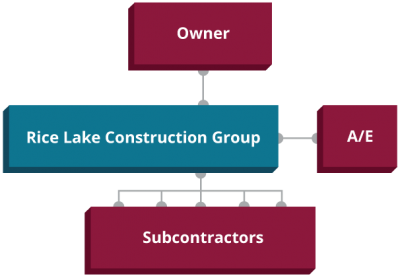 In this delivery method, Rice Lake Construction Group serves as the Construction Manager, from design through the construction phase of development. 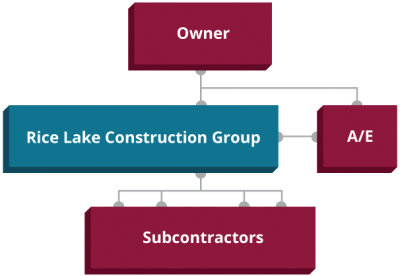 In the CMAR delivery method, Rice Lake Construction Group holds the subcontractor and vendor contracts, taking on the financial risk of the project. 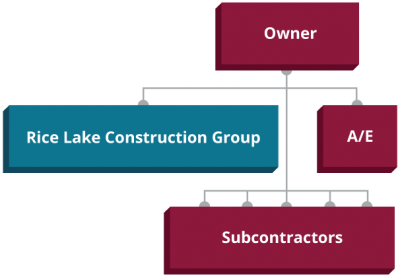 In a Construction Management project, the owner contracts directly with Rice Lake Construction Group, the architect/engineer and all subcontractors and vendors. As the Construction Manager, Rice Lake Construction Group manages all the contracts, but the owner holds the financial risk.